As a freediving professional I used to spend close to 300 days a year in the water, basically teatching, coaching, filming and at some rare occasions training. I remember reaching max performances after only 5 to 10 deep dives ( something I d never recommend to someone else ) I could do that because my body was adapted to that. That was all. Except some surf and some GS snowboard sessions, I never ran, cycled or lifted weights. I am now an Osteopath running my own buisness in Nice. As you see, things are getting serious :) I can't spend those 300 days in the water as I used to and I don't feel I am in such a good shape anymore. 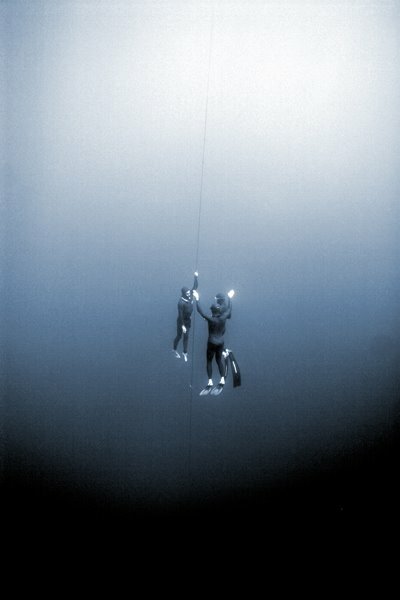 I have recently started to prepare myself for the AIDA freediving worlds that will take place here at home in september 2012. 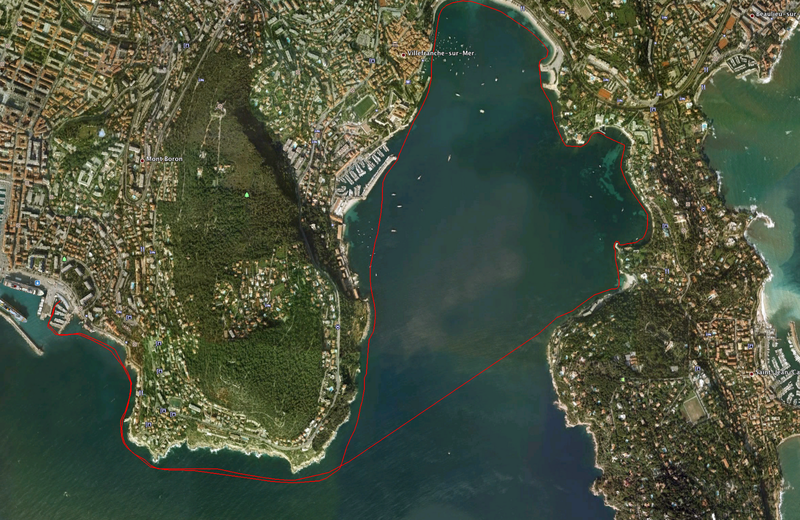 I haven't been seriously in the water for the past three years but I am lucky enouth to live in front of one of the very best freediving spots in the world, the bay of Villefranche sur Mer. The place is sheltered, protected from major winds and swells. We find extreme depths at only a few strokes from the shore. At one hour and half drive from Nice, you have the Mercantour national park and the snowy slopes from the "Alpes maritimes". I guaranty : this is the place to be ! I ll spend the next 8 month training here to compete with the very best freedivers in the world. For the first time in my life I ll have to get fit for that purpose, mainly in terms of general muscular strenght and cardiopulmonnary capacities. For that matter I have integrated stand up paddling in my day to day training. I couldn't find a better sport to get back in good shape before starting deep dives again. 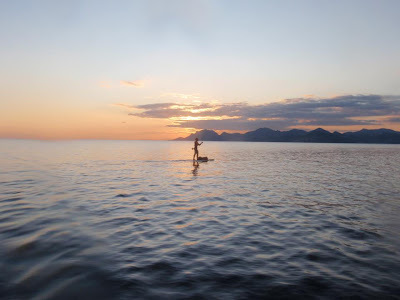 Stand up paddling is a fun practice that will have your muscles working in an Isotonic way ( concentric/excentric ) But what's good about this S.U.P is that your posture muscles will mainly work in a Isometric way. Far less trauma, more fibers recruited, probably the best way to work efficiently your muscular deeper layers without getting hurt. How come ? Well, we need constant "micro" postural adjustments to keep the position on the board. Muscles are constantly compensating the movements of the SUP. This is precisely what to people spend hours working at the gym with a a swiss ball ( not much fun huh ? ) 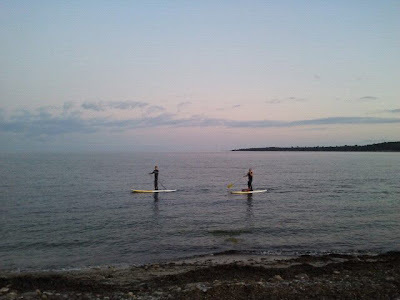 You can get the exact same core strengthening just paddling and gliding breathing fresh air along the coast. Working your core will also help you monofining more efficiently without any loss of energy. For people like me who are rather fast divers with stiff monofins, it is certainly something to be worked seriously. S.U.P is also an excellent way of getting an acceptable VO2 by both working your pulmonnary and cardiac systems. Depending on the intensity, the distance and the recovery workout you choose, an S.U.P will drive you threw the different training cycles of your physical preparation. Most of the companies have developed Race SUPs or Fitness SUPs that deserve all our interest. Their glide properties are great...some are rather stable and can be ridden without much experience. That is a fun and healthy way to increase your ventilatory system parameters. Develop both inspiratory and expiratory muscles, increase your vital capacity, reduce ( most probably ) your residual volume ... extend your hability to store more air before your immersions. The systolic ejection volume ( SEV), the capacity you heart has to eject a certain quantity of blood per beat. This is given by its inner size. The bigger, the better. This can be worked out during long periods of low intensity exercices. Keep your HB low ! The frequency your heart is capable to reach. Your heart should be able to beat as low as possible ... but also at a fast rate if necessary. This is given by the muscle's contractile efficiency. Should be worked out only after getting an acceptable SEV ! The amount of red cells in your blood stream is an important aspect of freediving that can be worked out in SUP. Short, intense and repetitive paddling ( CO2 tables with hight heart / ventilatory frequency + lactats ) increase the amount of red cells. Having more red cells means storring more O2 ... more confort and safety during the dives. The arterio-venous complex, master piece of the VO2 quality, also benefits from SUP Training. It offers a better reactivity to the diver needs. Vaso dilation or constriction is essential in deep immersions where mammal reflexes create massive movements of blood. This capacity the arterio venous system has to adapt participates in saving the freediver from lung injuries ( blood shift ) and helps him diminuishing O2 consumption. These are three of the SUP training sessions I have done. 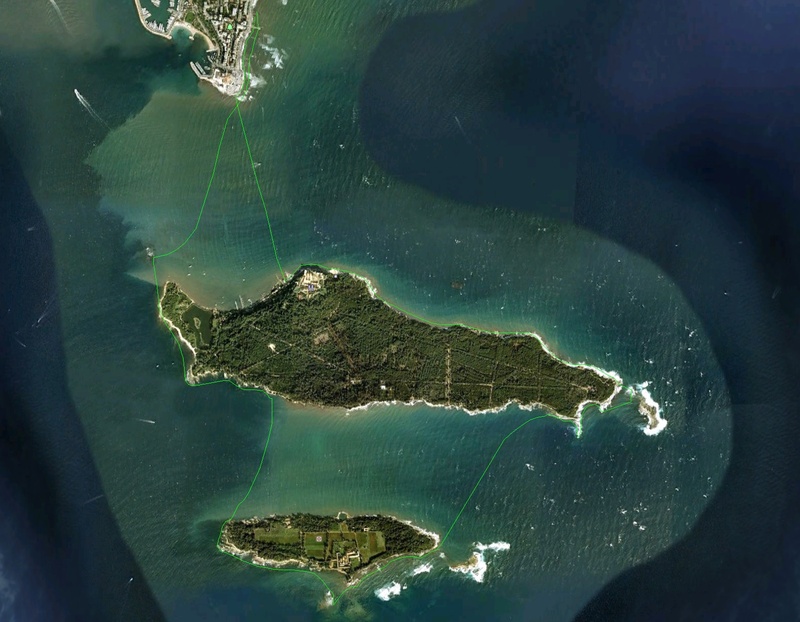 the two first were done around "les Iles de Lérins" in Cannes, south of France. 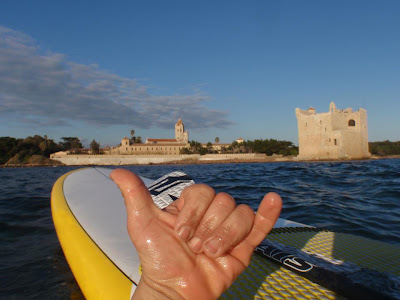 An amazing spot where racing, surfing and freediving can be practiced during the same session. In average these are 10 to 15 km sessions at low pace. This run was in the bay of Villefranche sur Mer where the worlds are taking place in september. Some small waves can be found in the north part of the bay ( South - South west swell ). Otherwise the bay is perfect for cruising in flat water. 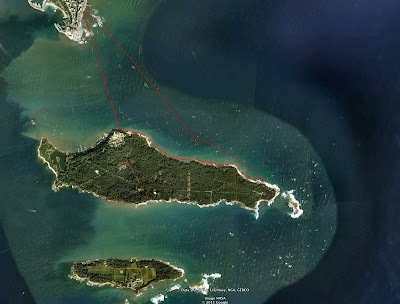 Reaching your favourite freediving spot paddling is definitly more adequate than getting there with a massive and noisy powerboat.